I love how food can mentally transport you to another time and place in your life. For me, it is the mango. 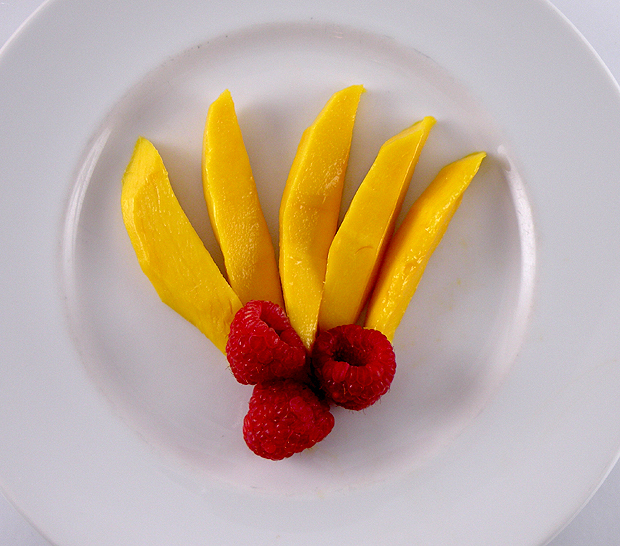 Mangos are by far my favorite fruit and always make me think of vacationing in St. Lucia — sitting at an outdoor café on the beach and enjoying the delicious tropical fruits of the island. There are so many different varieties of mangos but I think that the most delicious of all is the Champagne Mango. Its soft buttery flesh is sweet and juicy without the stringiness of some mangos. I was given a Mango Splitter as a gift and I really didn’t expect much because novelty gadgets usually don’t work very well. This one has made it so much easier for me to enjoy my favorite fruit. The mango seed is very large and difficult to cut around. 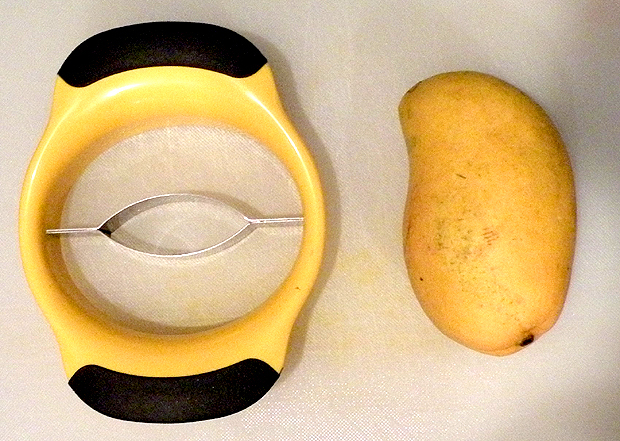 This little tool slices the mango in half and leaves very little flesh attached to the seed. 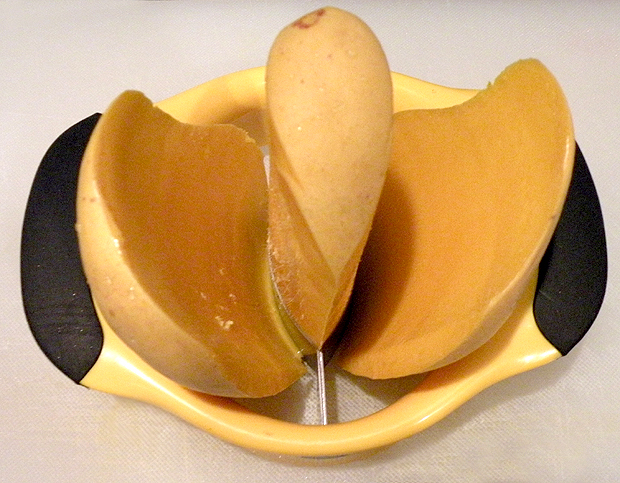 Place the mango standing upright on a cutting surface and place the mango splitter on the center top part of the mango. Push down on the mango splitter to separate the seed from the flesh. It should be easy to press down. 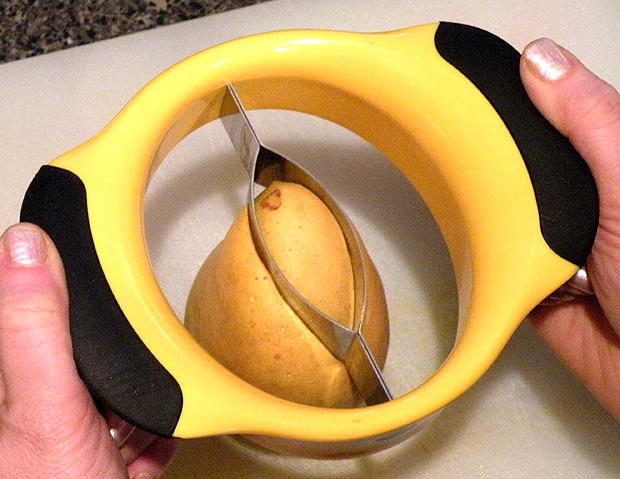 If it is difficult, you are trying to slice through the seed and you need to reposition the mango splitter. 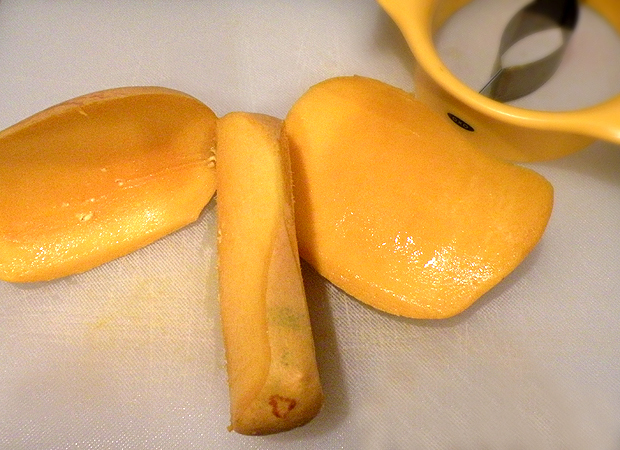 Remove the seed from each half of the mango and peel off the skin. Cut the remaining mango from the top and sides of the seed. Enjoy! This entry was posted in Everything, Food and tagged Champagne mango, cutting mangos, Gina Tepper, mango fruit, mango seed, Mangos, OXO Mango Splitter, peeling mango, sliced mangos. Bookmark the permalink. Now I want a mango splitter. I love it when products actually do what they claim.